First off, sorry for the pun in the title. I know, it’s pretty bad. Second off, if you like your cat furniture to match your human furniture, just know that you’ll hear absolutely zero judgement from me. 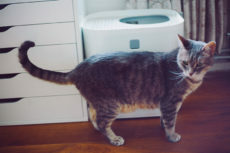 After all, I’m that person who went so far as to buy quite an expensive litter box – a modern, Modkat top entry litter box – in a lovely, glossy white just so I could best match my all-white Ikea furniture back when I just started living in my studio flat. 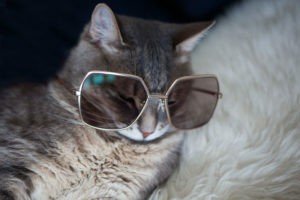 Back when I lived in the studio, every single cat item I looked up to buy was only attractive to me if it looked like it would fit in well with my all-white and pine accent furniture. Plainly put, this was mostly because – living and working from a studio – I just didn’t want to have to dislike anything about my space if it was at all possible. 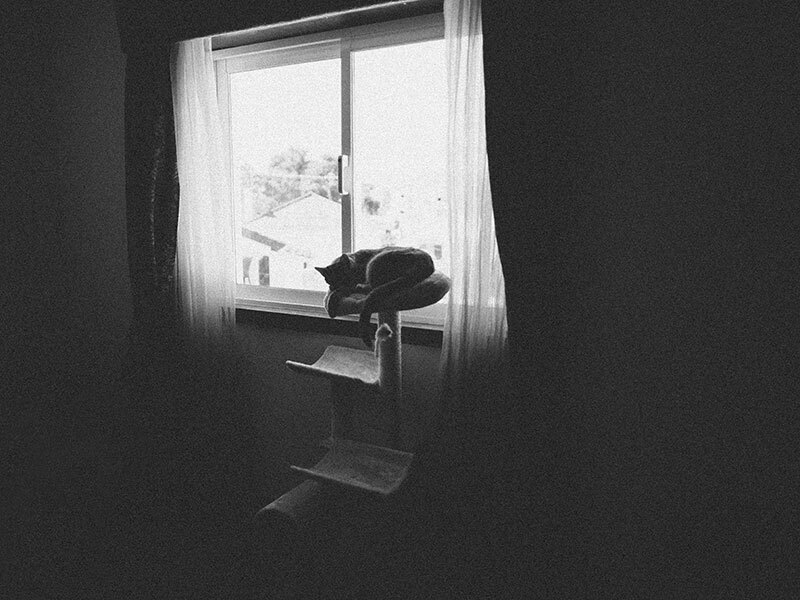 Now that I’m in a big house, I’m a lot less picky about what I grab aesthetically, but I know if I were to choose exactly what I wanted, and perfect every single room, I’d go back to that precise way of planning out cat furniture like I used to. 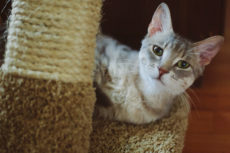 That ramble over, if you’re here for grey, grey, grey, you may be surprised to learn you actually have quite a lot of options, especially if you’re not all too fussed about the entire cat tree being grey, but at least want it to have gray bits to match the rest of your room. A lot of the trees are a combination of gray and that light beige natural sisal rope comes in, so if you’re going for neutrals with a gray base, purrfection. Some trees are gray and black, wonderful if you’re going for a grayscale theme for the room. Some of the trees are brown and grey as well, so if that works in your scheme, you’re not out of luck. And of course, since it’s gray, there are plenty of shades of it for you to choose from – light grey and dark grey is the usual, I haven’t seen much medium grey, but there are silvery tones and there are a few that are more matte as well. Fed up with reading about grayness over and over again? Me too. Though sadly, it’ll have to continue a touch, I’ll do my best to tone it down. 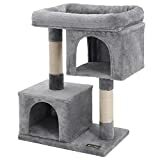 I spoke about this cat tree in my article about narrow cat trees that are slim and long, and thus perfect for small apartments or even those who live on houses and yet are tight on space. 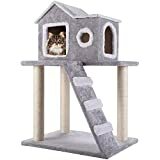 These have so much jumping room packed into such a small footprint that they’re excellent cat trees for anyone trying to fit more room for kitty in without making the entire floor plan about cat furniture. 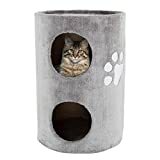 I feel like this Songmics grey cat tree addresses what so many pet parents want most in cat trees exceedingly well: more hiding spots for cats to hang out in and the equivalent of a cat bed topper for any kitty to happily bask in the sun in. A lot of pet parents love this product to bits, even those with especially large breeds, or overweight kitties, or both. 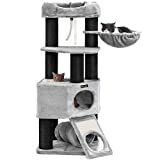 The fact that this cat tree looks extremely sturdy means it also seems to me to be one of the best you can get for large kitties, but that’s a topic for another day. 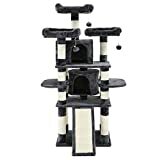 One alternative with a similar design, though in my opinion, less ideal for large/overweight kitties: the FEANDREA Multi-Level Cat Tree with Feeder Bowl. 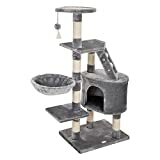 If you’re looking for modern and sleek, I can hardly think of a small gray cat tree that’s more gorgeous than this one. It’s not fully greyscale, obviously, but I think the brown paper rope used instead of standard sisal is so stunning, it’s a definite stand out piece to me. Check out how amazing it looks in a home. Yet another FurHaven cat tree I’ve spoken about before, again in the narrow cat tree article, but also in my round up of some of the best floor-to-ceiling cat trees around. If you want modern, sleek, cheap, and with a huge emphasis on space conservation, this is absolutely the way to go, and the fact that they’re so tall means kitty will never mind the narrowness. All the fun in as slim a space as physically possible. 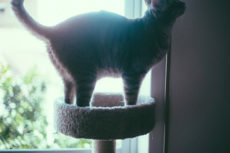 Cat step style cat trees are incredibly good for using as stairs that lead to a cat’s favourite spots, like a bed or a windowsill, especially if you’ve got a kitty who’s disabled or struggles with mobility issues due to old age or arthritis. 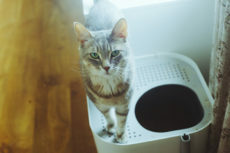 they’re also really well liked by pet owners who have dogs in the household, as most senior dogs who struggle with mobility can easily use these kinds of cat trees to get to high places as well. 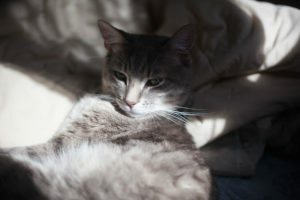 If you’re looking for an inexpensive cat tower that’s also not too small or short, this is likely to be up your alley. 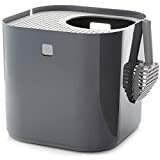 Based on reviews, I think it’s one heck of a deal for the price, and while at first glance it looks like it might be unstable, there are testimonials from reviewers who say it actually holds its own and stays up quite well: “I have three cats and they all use the top pedestal for naps. It has never tipped over, even though the kitties have tried with their wild chases on it. They scratch on it daily and it has held up well. This tree has 3 platforms and my cats enjoy lounging on each of them. They use every aspect of this tree. I am considering buying a second one to attach to the old one to give them more room.” Don’t know if there’s much more you could ask for! Cat love hanging out? Ever tried grabbing kitty a hammock? 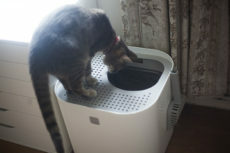 How about one that’s integrated in a cat tower? Cat trees with hammocks are definitely a thing, and while I haven’t yet grabbed a kitty tree with this function on it, I’m determined to eventually get my hands on one, because cats seem to love haning in hammocks so stinkin’ much! 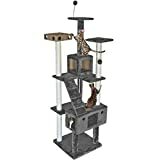 A couple more grey cat trees that have hammocks integrated into them: the BEWISHOME Cat Tree Condo Furniture Kitten Activity Tower & the SONGMICS 58″ Cat Tree Condo Tower with Hammock. Thinking of going big or going home? Massive cat jungle gym more your kind of thing, so it’s the one tree perfect for all the cats in your household in one go? I like this particular grey tree from Songmics for that, but there are a couple others I think would do the trick just as nicely. 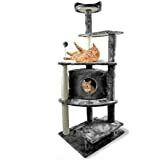 They’re the: AmazonBasics Hammock & Tunnel Multi-Level Cat Tree & the Yaheetech 51″ Cat Tree Tower Condo. 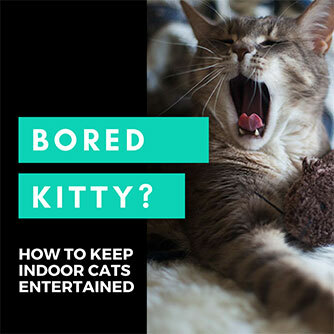 Thinking of positioning your grey cat tree somewhere in a corner in your room? Some cat towers just seem to look ever so much better in corners than others. 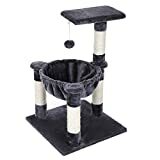 I think this particular cat tree looks amazing sitting in a corner, though be aware, it’s base won’t be flat along the wall, so it may take up more room than you expected. 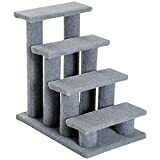 Another great option if you’re looking for a small cat tree in grey. One more, because I just can’t resist. 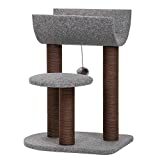 A grey large cat scratch post/small cat tree that’s similar in size to this one yet pretty darn cute: Trixie’s Murcia Scraching Post, though yes, the fact that it’s shaped as a Swiss cheese probably doesn’t float up everybody’s alley. I think it’s adorable, though! 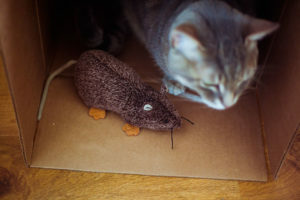 Especially since its base can double as a cat toy box – or well a triangular one. 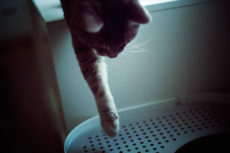 I’ve never tried out a kitty barrel before, but I really used to want to when Thomas and I were living in our small studio flat. The idea of me using it sort of as a portable cat bed really appealed to me, but I wasn’t sure how much Avery would use it, so I opted not to try it out, as I had limited space. Now that I have way more room to test out products, and a second cat to test out kitty things out for on the way, I’m really interested in giving barrels a whirl again. Ever tried one? 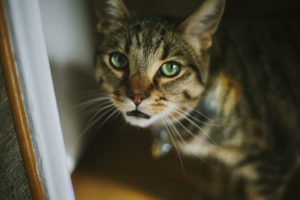 Let me know what your cat thought about kitty barrels in the comments! I think the fact that this grey cat tree has black dyed sisal instead of the standard natural sisal colour is so gorgeous. That light grey and dark black really does it for me, probably more than any other colour combination due to how much I love contrast. I’d love for more sisal to be dyed black like this since the end result is so pretty. What do you think? Okay I know this is not at all modern looking, but that’s totally cool with me, because I think it’s both adorable and incredibly likely every cat will obsess over how comfy cozy this thing is. Also the photo ops? 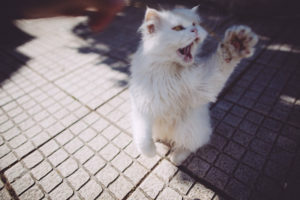 Crazy killer cute. But really, could there be much out there more adorable than a cat sitting in a tree that looks like a human house? I haven’t actually got a clue whether many cats would like cat condos with ladders on them, but even if they’re nothing but a cute feature for us humans to look at, I think they’re a dang nice touch. 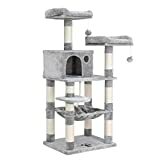 This gorgeous silver looking cat condo is gorgeous, in my opinion, and a great option for multi-cat households based on how many different nooks there are for separate cats to be napping in. 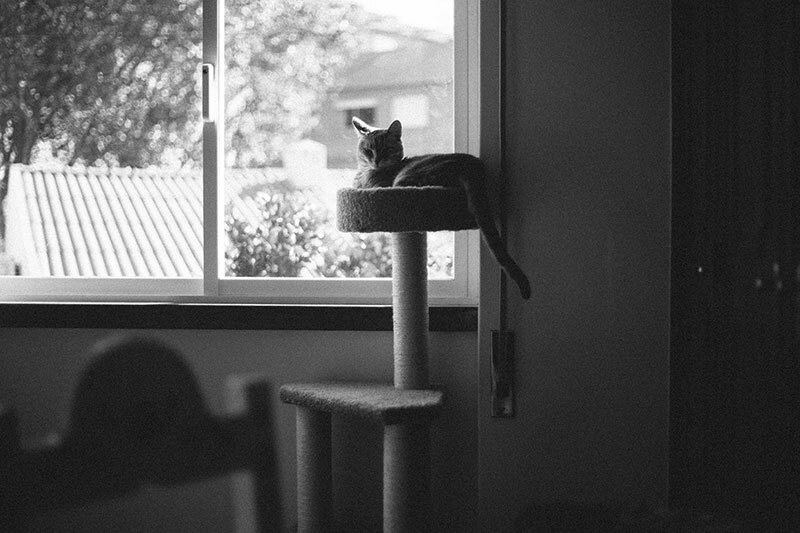 Your Thoughts on Grey Cat Trees? Ever bought a cat tree of a specific colour just to match your furniture and make sure everything in the room follows the same general theme? Do you like the look of grey cat trees? Which shades do you like best? Light or dark? Silvery or more matte? Do you like the look of sisal when it’s dyed black? Do you prefer natural sisal colour? What about brown paper instead of sisal – how do you like the look of that aesethically? Are there any cat trees you think are prettier than others? 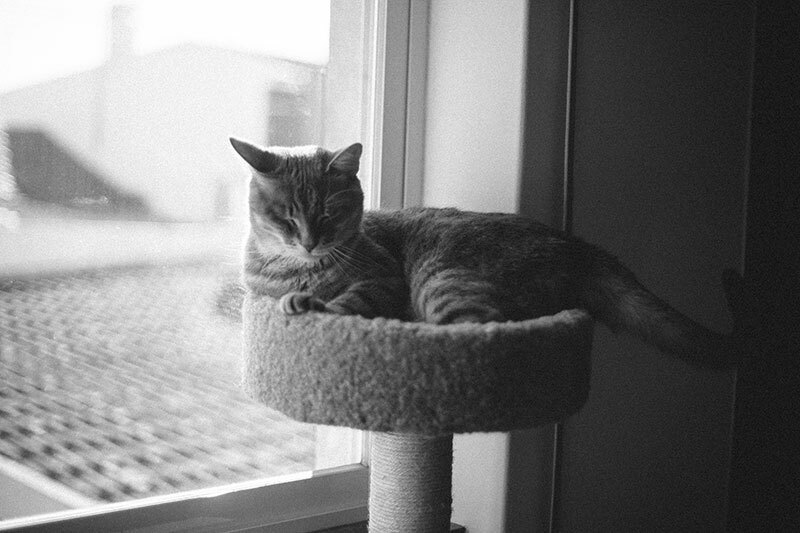 Any beautiful grey cat trees I missed adding to this list? Love to hear your thoughts in the comments!